Why do we travel? Temporarily transporting ourselves to foreign places, regardless of how far removed from home they may be, is both exciting and frightening, and quite often time-consuming. To travel is to break routine, to take a willing step out of the common steadiness of the household, striding apace with the human urge to explore. Most of the time I’m content to move within the spaces I’ve carved out for myself in the communities I love and live within. I think this a shared sentiment: we love our homes because our memories tie us to them. 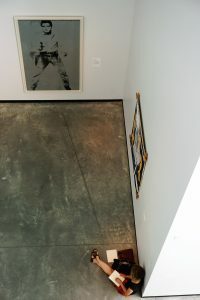 Memories of being, of experiencing a space, personalize, they superimpose peoples’ past interactions with structures and the memories of those interactions. Places are pieces of our identities, they are, as Michel de Certeau wrote, “fragmentary and inward-turning histories, pasts that others are not allowed to read.” There is a distinctiveness to each of our home spaces, a uniqueness imbued in everyone’s domestic experience, such that the home can only ever be alien to others, even those with whom we might share our home space. Our homes are exclusive, the stories within their pages entirely our own, illegible to those who would try and read them. Despite the comfort and ease of my own homebound ‘histories’, I never fail to agreeably, even eagerly, exit the home: to embrace an opportunity to travel. I crave the sense of belonging inherent in many communities—and I thrive because of the networks I craft within them—yet I yearn for novelty, and I never shy away from exploring a new corner of the modern world. Indeed, instead of the place itself, its architecture, foodways, and the people populating it, sometimes I most look forward to the ambiguities—the unknowability of the place, the not-now of its histories and its future—and a familiar hesitancy to map the unmapped. Just as the home is steeped in individuality, so too are the places we travel to. Our travel to certain places, and the time we spend in them, constitutes a web of histories in that place, memories and sentiments unknown to all others. This summer I had the pleasure of writing many personal, micro-histories of cities, parks, museums, and of doing so in gatherings of others doing the same. It was a summer of mapping for myself many corners of the world. In this photo essay, I will try to convey some simulacra of those ‘histories’, and hope that they call you to write, and thus to experience, your own.
) Having never before been to New York City, I made the trip out east three days before the start of the History Scholar program. My dad, an endearing man he is, made the trip with me. Though we spent the entire weekend together, this particular night was wonderful. 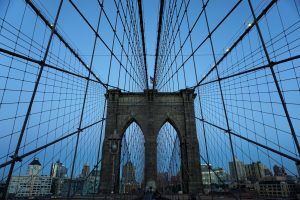 Earlier on we saw the play version of Orwell’s 1984, and, having so much to discuss, we decided to make the long walk from Times Square (we were staying in a hotel on 45th and 7th) across the Brooklyn Bridge, and from there walk another mile or to eat at a to-die-for pizzeria. I don’t know that I’ve ever had a more enjoyable walk, nor company with whom to share it. During the same week in New York, I repeatedly lost myself in Central Park. On several occasions throughout the week, I spent hours meandering in the foliage. Absent my ambitions, worries, and all the cares in the world, I danced atop the park’s many protruding rocks, spent countless moments people-watching with new friends, all our lips childishly stained from snow cones. I tried to capture the joy I felt in those hours with pictures and poetry both, but the carefree jollity I felt in the Big Apple’s greenery was simply fleeting. 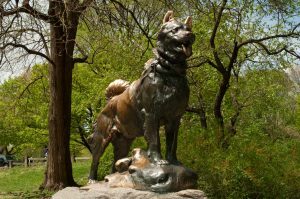 Whenever I try to remember that feeling, I always find myself returning to this photo of Balto’s statue in Central Park. I can describe neither its draw, nor its relationship to my experiences in Central Park, but maybe that’s because its meaning is as fleeting as the experiences themselves. The History Scholar cohort had the incredible opportunity to peruse the Gilder Lehrman archives. Appraised as “priceless” by multiple accounts, every shelve in their archives houses irreplaceable artifacts. One such artifact is pictured above. 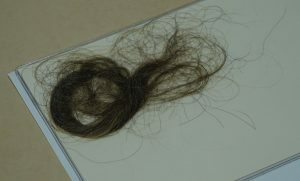 Yes, that is a lock of hair, and it belonged to James Madison. A week or two after returning from New York, I made my way down to Atlanta, Georgia, for a conference on economics. Having arrived about 7 hours before the conference commenced, I stowed my bags away in my hotel’s lobby and left to explore the city. I walked about 11 miles in the following hours, all of which I spent admiring Atlanta’s abundance of public sculptures, some Southern food, and several museums. 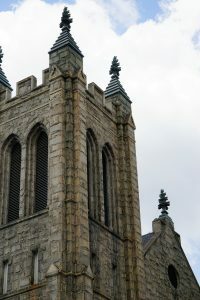 I can’t remember the name of the building pictured above, but I clearly recall its brutal, brown, spire-like ornamentation striking me in its contrast with the clouds. For the remainder of the three days I had in Atlanta, I used up most of my free time by walking back to this building, sitting in a bench under its shadow, and reading through materials for my summer research. I hope to one day return to that oddly memorable, well-shaded spot. 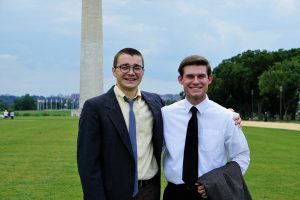 In late June I spent a week in week in Washington, D. C., as a participant in on one of the American Enterprise Institute’s summer honors programs. In the evenings after our lectures and dinners, small groups of us broke off from the whole and explored our nation’s capital. The program I participated in was centered around pluralism in America, and was led by a kind, brilliant scholar from Washington University in St. Louis, Dr. John D. Inzau, whose new book, Confident Pluralism: Surviving and Thriving Through Deep Difference, served as a touchpoint for our discussions. Exploring the National Mall one evening, I decided to linger around the WWII Memorial. A dozen minutes or so later, I was lucky enough to witness these two young girls meet each other as they dipped their hands in the Memorial’s pool. 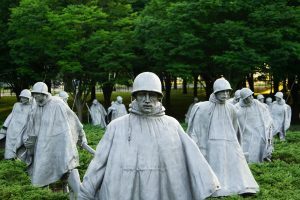 Two or three nights later, I visited my favorite memorial in Washington, the Korean War Memorial. My Grandfather, Tullio Joseph Buccitelli, fought honorably in the Korean War. He earned a Bronze Star for his bold honesty, and a Purple Heart after he was wounded by shrapnel from a mortal shell barrage. Winding through Washington that evening, I couldn’t shake a revived sorrow I felt at his loss over three years ago, and wished that he were there with me, laughing, naturally arching his unusually bushy eyebrows, coloring my understanding of that Memorial with histories of his own. As my week in D. C. came to a close, I went to the Hirschhorn with some good friends. One such friend, Garret, is pictured above on the right; my dopey figure is on the left. Garret is a loyal lad to people and ideas both, one who trades in timeless aphorisms, who treads above fads and fiercely defends the things he holds to be true and good. Though we disagree often, I always look forward to meeting Garret throughout the year. We put pluralism into practice. In early August, I traveled out to Portland, Oregon, to kick-off a year-long ISI Honors Scholar Fellowship. I spent a week on the West Coast discussing ideas about American Founding, the trappings of good government, and the human condition. In our free time, we enjoyed the wonderfully weird city of Portland, particularly its cultural offerings. 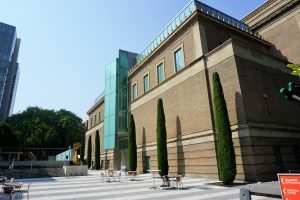 Pictured above is the Portland Museum of Art, a surprisingly splendid museum, filled with some stunning Expressionist and Post-Expressionist art, and an equally impressive collection of Modern Art. While moving through the museum’s exhibits, I snapped this picture as I looked over balcony on the fourth floor. For some reason, I found it enchanting. 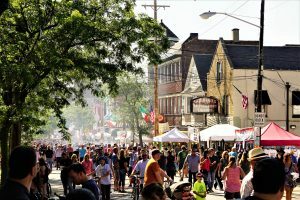 All my summer travels said and done, I attended the Feast of the Assumption in Cleveland’s Little Italy in mid-August. While not traveling and at home in the suburbs of Cleveland, Ohio, I spent every Monday and Tuesday in Senator Sherrod Brown’s as a constituent services intern. My appreciation for Cleveland grew considerably during those Mondays and Tuesdays, and renewed my love for the city I call home. Michel de Certeau, The Practice of Everyday Life, (Berkeley, California: University of California Press, Berkeley 1984), 108.